We’ve talked a lot in the past about deck building and card evaluation. Let’s take some time to look more at actual gameplay, specifically, how to do well in the opening phase of the game. I like to think of the opening as being the time from the start of the game, until when the corp has constructed some defense on each important server (R&D, HQ, maybe archives, and the primary remote). Additionally, it is still the opening until the corp can afford to rez all this ice. Simply putting it there isn’t enough if you can’t pay for all of it. The opening is the period of free accesses. It’s the time when the runner is capable of getting into some server for an access, for a cost of only a click. In general, the corp should do everything it can to get out of the opening quickly, while the runner wants to prolong it for as long as possible. 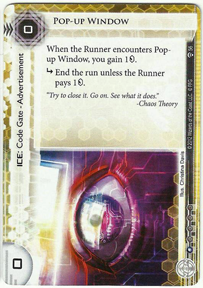 Entire runner strategies are devoted to abusing the opening phase of the game, while the desire to leave the opening is the reason that corps include economy ice like Popup or Caduceus, as well as cheap End the Run ice like Ice Wall and Enigma. Scout out the lay of the land – the ice defenses placed by the corp.
Gain ‘free’ accesses – accesses of cards that might possibly be agendas, for the cost of only a click. Lay the groundwork for your long term economy development, such as Kati Jones, Wyldside, Personal Workshop, Daily Casts, Professional Contacts, etc. Finally, you would like to extend the opening if possible. Face checking is the process of blindly running into face down ice, without icebreakers and seeing what happens. As terrible as that might sound, it usually has good results for the runner. The corp cannot afford that ice. That ice is a program trashing ice which currently doesn’t do anything. You’ll probably not want to run it once you have important programs, until you also get a sentry breaker. The corp can afford to rez the ice, but cannot afford to rez ALL of their ice, and they consider that server to be of lower importance than others. The corp is bluffing you (this is the least likely alternative by far, unless playing someone with a strong history of trying to bluff you). It is turn 1. The corp (Weyland) played ice on HQ and R&D and took a credit, leaving them at $6. You run HQ and the corp doesn’t rez the ice. What information do you gain? The chance that the corp has no agendas in hand is increased. The chance that this piece of ice is either expensive or trashes programs is increased. The chance that the corp cannot afford to rez BOTH his ice is increased. Maybe it’s a Bastion, and he could rez it if needed, but that would make him unable to rez the Enigma on R&D, and you might then hit him with an Indexing or something. The chance that it’s a cheap ice, economy ice, or anti-face check ice like Popup, Shadow, Caduceus, Ice Wall, or Neural Katana, is GREATLY decreased. 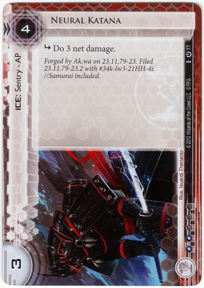 Given that your opponent is Weyland, what is that ice most likely to be? It is probably either expensive (Archer/Hadrian’s/Tollbooth/Swarm), moderately expensive and not currently punishing (Bastion, Data Raven, Grim), or something more rarely seen in Weyland like maybe Rototurret. It’s probably NOT Ice Wall, Shadow, or Caduceus. You now know information about that ice. You should try to use these modified probabilities later on in the game, to avoid making a mistake. It is turn 2. The corp (NBN) has unrezzed ice on HQ, R&D, and a remote. They played a card into the remote last turn. They have $6. You play out an R&D interface, and run R&D. The corp does not rez! What information do you gain? It is significantly more likely that the card in the remote is an agenda. The corp probably cannot afford the ice guarding it and the ice on R&D, and has chosen to allow you to get a double R&D access, because it’s not as bad as losing the agenda! It is more likely that the R&D ice is large like Flare or Tollbooth, or is a program trashing ice like Ichi or Grim. 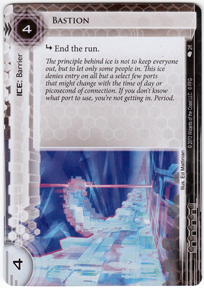 It’s very unlikely that the ice is cheap or is an economy ice like Popup, Shadow, Hunter, Caduceus, Ice Wall, etc. What should you now do? If you have ways of getting into the remote server, trying to do so is a good idea, because it’s probably an agenda (though maybe it’s a Melange, which you also want to kill). Face checking the remote, and then trying to get into it by playing a breaker and running, using Inside Job, etc. would be a good plan. If your plan for getting into the remote requires the rest of the turn, don’t face check it first. (For example, if you need to play a breaker, play tinkering, and run, do that). If you have Inside Job, first run the server, then Inside Job it I they rez an ice that stops you, don’t simply Inside Job the face down ice. If you don’t have ways of getting into that remote, you should probably run it anyways. A likely result is that the corp spends money stopping you. Either they are then too poor to score an agenda, giving you more time to find an answer, or they score it but go broke doing so, which gives you free accesses of R&D and HQ the following turn. If you were able to eliminate at least one of the R&D cards, running it again is a good idea. Running HQ is also a good plan. It is turn 1. The corp (HB) drew an extra card, then played ice to HQ and R&D. They have $6 (due to HB power). You run HQ. The corp rezzes a Bastion. What information do you gain? It is likely that the corps hand contains agendas, and/or other low cost to trash cards that they care about like Melange. They rezzed an ice for the majority of their money just to stop you, even though it might stop them from rezzing R&D ice. It is more likely that the R&D ice is very cheap. They might be able to afford both ice, because it’s an Ice Wall of Popup. What should you do now? If you have a way to negate the Bastion and get to HQ, that’s a good idea, you’ll have a strong chance of agendas. For example, playing a Sneakdoor. Alternately, playing Corroder, running HQ, and playing Emergency Shutdown on the Bastion. Or playing Parasite onto the Bastion so that it will die soon, exposing those HQ agendas to you. It’s worth running R&D. The worst that can happen to you here is that it’s a Popup Window. If the corp rezzes Ice Wall, you’ll know that getting a Corroder will be very important. If they corp doesn’t rez the ice, you will have confirmed that it’s at least cost 3, and you will have reinforced the belief that HQ is really important right now, because the corp rezzed defense there which prevented them from rezzing R&D ice, meaning that HQ seemed MORE important to them. It is turn 1. The corp (Jinteki PE), played ice on HQ, installed two remote servers, and said GO. They have $5. As the runner, you have an opening hand of Daily Casts, Corroder (one of two in the deck), Yog (your only code breaker in the deck), Sure Gamble, and Plascrete Carapace. You almost certainly should not run HQ click 1 with this hand, against Jinteki. The chances of hitting Neural Katana and losing key breakers is very high. If this occurs and you continue you are at risk of hitting Fetal AI. Running R&D is okay. A Snare hurts you but breaks the opponent. Running the remotes is a better idea, but is most likely to result in wasting time on economy cards. However, you must check these remotes some reasonable percentage of the time, or else you open yourself up to opponents placing undefended 3 difficulty agendas against you and then scoring them. The best plan is probably a mixture of running those remotes some, and playing key cards and economy boosters out of your hand and drawing back up. Playing against Jinteki is quite different from playing against other corps. It is riskier to face check with key cards in your hand. While against other corps (especially HB), those programs are safer in your hand at the start, against Jinteki they are safer in play. In general, the best play is to develop long term economy cards, and key breakers or other things out of your hand, draw up, and then run a bit later once your hand contains cards of less vital importance. Let’s say that you draw two cards, play Daily Casts and Corroder. On turn 2, the Jinteki player rezzes one of the remotes, a Pad Campaign. He plays an ice to R&D, and takes $1. The corp has $5. What information do we gain? The other remote almost certainly ISNT a pad campaign. If we can get the corp below $4 and then run it, that is a great plan, because we would be safe to Snare. However, it’s less likely to be a 3 difficulty agenda. It’s still worth running. The R&D ice is less likely to be a Neural Katana than the one on HQ. It is more likely that the corp just drew it off his deck. If you ran R&D last turn and saw an Ice, it is very likely to be that ice. After all, why did the corp play only one ice on turn 1? Since it wasn’t for the purpose of installing two Pad Campaigns, it might be because he only had one ice. On our next turn, we run R&D. The corp rezzes Himitsu Bako, putting them at $3. We run the face down remote. We hit a Fetal AI, and lose 3 cards and pay $2. This is acceptable. Note that running it without $2 would have been a mistake. We now draw back up since we have lost cards. We draw into a Kati Jones, and are happy. We are Andromeda, and played out Sure Gamble, Daily Casts, Desperado, and a Dirty Laundry to Archives on turn 1. 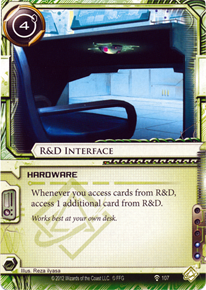 After turn 2, the corp (HB) now has iced R&D, HQ, and a remote, and placed a card into the remote. They have $9. 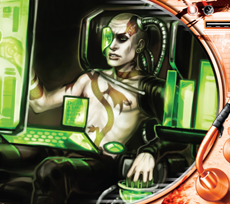 Our remaining hand is Datasucker, Corroder, Ninja, Plascrete, and R&D Interface. We decide that we think the remote contains an economy asset, so we install Datasucker and run archives 3 times, getting $3 and 3 suckers. The corp rezzes Adonis Campaign, draws two cards, and ices Archives. They still have $9. What do we do? Let’s consider the game state. We would love to kill the Adonis, denying the corp. We have $14 currently, as well as income from Desperado and $4 left on Daily Casts. If we can break the corp, we can drop R&D interface and pound R&D with it’s ice unrezzed. If we run into Rototurret or Ichi, we risk our Datasucker. Running into Ichi with clicks left isn’t too bad however. We play Ninja (to avoid losing sucker to Rototurret), and run the Adonis Campaign. The corp rezzes Bastion putting them to $5. We play Corroder and run Adonis Campaign. We shrink Bastion twice with suckers, break it, and kill Adonis. The corp places another ice on the remote, places another card in the remote, and takes $1, bringing them to $6 (with HB power, and paying for the extra ice). If the newly installed card is an agenda, the corp won’t want to break themself. If we run centrals and the corp doesn’t rez them, we get free accesses, datasucker counter, desperado money, and we become more sure it’s an agenda. We run HQ. Now, imagine you’re HB. The card you put in the remote is a 3/2 agenda. You have another 3/2 agenda in hand. What do you want your HQ ice to be right now? Ice Wall is nice, it lets you protect the agenda, stop datasucker/desperado gain, and still afford to protect the agenda in play. Popup Window is nice. It gains you money, helping you to defend everything, while limiting the runner’s gain. If he goes through it and doesn’t hit the agenda, he is less likely to keep hammering HQ and find that agenda than if you rez nothing. Something like Wall of Static or Eli or Bastion is disappointing here, even if we didn’t have Corroder. It eats your money and you can’t rez other things. Something huge is very disappointing. Back to the game, the corp declines to Rez the Ice. We look at a card in their hand and see a Heimdall 2.0. What do we do? Running HQ again is strong. We just got a $ and a sucker and an access for 1 click. Doing it again would be great. Running R&D is strong. Our opponent is reluctant to rez, and we might be able to punish it. Running the remote is strong. Most likely they will have to rez the ice, it only stops us if it’s a codegate, and we get in to something they want to protect. ALL RUNS ARE AMAZING HERE. What isn’t amazing? Sitting there and not running. Pressure is good, especially because we have built our deck to pressure well. Game path A: Let’s say we run R&D. The corp rezzes Popup Window, going up to $7. We pay and get in, seeing a Melange, which we trash. While Popup Window might leave the corp vulnerable, it doesn’t leave them as vulnerable as not being able to rez anything! It also helps them to get to a point where they can put another ice on R&D, score their agenda, and rez everything. What should we do now? Play R&D interface, run R&D, see two cards. It is now the corp’s turn. If he has affordable ice, he could put it on R&D, but the likely play here is to score the agenda. We hit R&D again, and HQ as well, and then the corp puts up more ice. Game path B: The corp rezzes Ichi 1.0, going down to $1. What should we do? We have two clicks left, but the corp is poor. We probably want to break the Ichi with Ninja, and go run HQ again and run the remote. We break Ichi with Ninja (but not the trace, since we are Andromeda! ), get in and see a card and get $1 and a sucker. We run HQ, corp doesn’t rez, and we get the agenda. We run the remote, corp doesn’t rez, and we find out that it was a Melange in this game, which we kill. Next, the corp draws, and takes $3, putting them to $4. What do we do? We run HQ. If they rez, we run Archives, building up suckers and money. Once stopped, we draw cards, to continue our economic development and hope to find an Emergency Shutdown. We would like to run HQ, shutdown the Ichi, play R&D interface and run R&D. Keep pressuring the corp. If we can combine that Shutdown with Account Siphon, preventing the corp from rezzing the Ichi and allowing free R&D hits, even better. If we can get a Forged Activation or Parasite, even better, we can kill the Ichi and go get free R&D hits. Hopefully these examples will help you learn to play better in the opening. You can see the value of early pressure. In our extended example, we are doing far, FAR better in this game, and getting many more accesses, than we would have in a strategy devoted to simply building up a bunch early in the game. You can also see how the corp is desperate for certain cards. They badly want cheap ice that does something relevant (taxes/gives economy, punishes face checking, or ends runs). And big ice in this scenario is just a liability. It looks like it’s defending a server, but it actually isn’t. A good runner will expose the fact that this big ice might as well not be there at all. We also see that the corp would LOVE a Hedge Fund. Play a Hedge Fund, and suddenly all scenarios where we can’t rez an ice because it would expose some even more important server disappear. We simply rez all the ice, and we are into the mid game!! 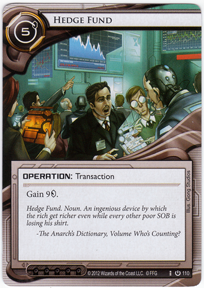 Please never cut Hedge Fund from your decks! The best corp starts involve having Hedge Fund. Don’t increase your chances of weak starts. Will your Pad Campaign give you more money after 6 turns if it lives? Yes. Does that bonus $1 you now have matter, when you’ve been Hemmorhaging free accesses all game? 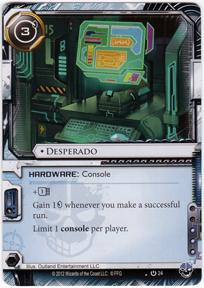 We can also see that runner cards which would perpetuate this early game state are amazing. If we Parasite an ice to death, we get to keep hammering the corp until he both draws, places, and pays for a replacement. He might fail to draw it, or be able to pay for it. At worst, we extend the opening somewhat, and delay the corp from achieving their goals. If we can Parasite or Shutdown some of the ice, or if we can Account Siphon the corp to break him, and then run things with unrezzed ice, we will extend the phase of the game where the corp can’t accomplish much and is hemorrhaging free accesses to us. What things should we NOT do as runner, in these scenarios? (Hi there, I wont stop you. Run through me all day in the early game? Please? You might get lucky, maybe I’m right in front of a Priority Requisition? Or maybe not). We should NOT run through an already rezzed ice that is draining to us, without sufficient reason to think we will succeed in getting something good from it. If the corp gets a rezzed Bastion and we can break it for $3 with a corroder, we shouldn’t just randomly keep running it without good reason (like we are Gabe and hitting HQ gives the money back. Or we have an R&D interface so the access is doubled). If the runner is taking NON free accesses repeatedly in the opening, the runner will run out of steam, and the corp will survive to the midgame having given up LESS accesses to the runner. Less accesses means less points on average, less info, less chances to trash that Mélange or trap off the deck. What things should the corp be doing, to survive this phase better? Any time that the corp can bait the runner into running something safe is great. Maybe the opponent isn’t criminal and you have only 1 agenda. You could leave HQ un-iced, instead making a remote and putting the agenda in it. Time spend running your HQ is thus wasted. Creating a remote with an economy or face check-punishing ice, and putting an annoying card into it, is another great plan. For example, making a server of Caduceus in front of Bernice Mai. The runner running this is amazing, you get to get money off the Caduceus, and punish the runner with a Bernice Tag, slowing them down. If they don’t run it, you can stick a Melange in there next turn and try to induce a run. Of course, you should execute this strategy with different cards placed into it. Sometimes an agenda, sometimes a Mélange, sometimes a Bernice Mai. You don’t want to become predictable. Sometimes you just slap down whatever card you have. Sometimes you have several choices, and you pick one. Drawing the runner into remotes that slow them down is a great way to blunt early central server attacks. 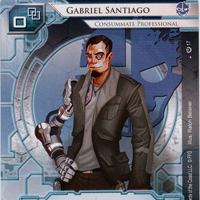 You also want to consider the opening heavily when building your corp deck. You need your deck to have some face check punishing ice, and some cheap ways to end the run. Decks of lots of large ice get walked all over by aggressive runners. You want to include burst economy in your deck, as it helps you escape the opening. Burst economy like Hedge Fund or Celebrity Gift also makes those early bigger ice a lot more palatable, you can rez them and not be broke. A deck with plenty of big ice needs to be very good at burst economy! Ice that punishes running is actually more beneficial at blunting early aggression than end the run ice. (You never have to not rez me to save money for something else. I provide at least some defense, and help you afford the real defense later). If you rez a Neural Katana they get in once, but they both don’t want to run it again without a sentry breaker, AND they lost three cards. They have to pause and recover. 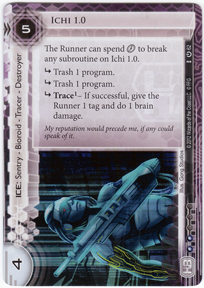 Similarly, inflicting tags can be a great way to slow down the runner economy, blunting their attack. 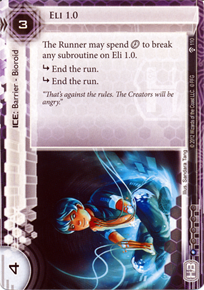 While the rezzed ice doesn’t technically stop the runner, it is just as effective because it makes them not want to run the server. It makes the run uneconomical, not free. 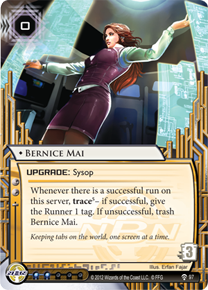 And early PAID accesses of cards aren’t very good for the runner, it’s early FREE accesses that are devastating to the corp. If the runner has to pay a moderate cost, then they can only do that so many times before falling behind the corp economically, and having to stop. It’s worth giving up a few accesses in order to get ahead economically. That’s the whole goal as corp early, give up as few accesses as possible while stabilizing! If the runner is voluntarily making runs through ice they have to pay for early on, they are accepting to get a much smaller number of early accesses, and as the corp I am happy with that. I am much happier with that situation, than one in which the runner instead draws and develops, finds the parasites or shutdowns, wrecks my ice, and continues taking free accesses! I am especially happy as corp if their runs are through a Popup, Shadow, or Caduceus that is giving me money! This really accelerates the corp’s early game, lets me race by advancing agendas, and helps me afford a better defense as soon as I draw it, bringing me into a strong midgame state. Pay attention to the things you learn as runner by the corp’s decisions to rez or not rez ice. As corp, against a strong player who pays attention to these, occasionally bluff. There is a cost to bluffing (you have to make a suboptimal play right now), but if it makes you less predictable or results in the runner making a bad run due to thinking an ice is something else, it’s worth it. However, DON’T bluff a Fish. If the opponent isn’t a good enough player to have any idea what your bluff means, and won’t change their play based on it, then play the best straight up move instead. (No card will do a better job of helping you correctly play well than I will. I provide you the incentive you needed to do the thing you already should have been doing – trying to get those free accesses. And I help you keep doing it, and benefit even more from it). Datasucker, Parasite, Medium, Desperado, Emergency Shutdown, Account Siphon, R&D interface, Maker’s Eye, Indexing. How many of those cards are you playing? 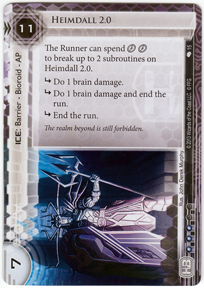 What factors do most good runner decks share? LOTS OF THESE CARDS! These aren’t the only important cards of course, or the only good early attack cards. Just some of them. But these are all good at increasing early weakness, pressuring early weakness, or gaining additional benefit from early weakness. Oh yeah, and every one of them is a good card later in the game too. Cards that help provide strong early pressure AND are good later? Yes please. Thats so much better than the conditional, only-good-in-one-phase-of-the-game cards. This is true for all factions, not just Criminals. You don’t have to be a criminal for early facechecking to be a good idea, or for free accesses to be good. And if your deck of some other faction has no early game, thats a problem. Maybe you can overcome it in other ways, but…you probably cant. You would probably do better to have at least SOME early pressure. Did you think you were supposed to play Noise by doing nothing but install viruses to mill cards for the first 7 turns, without making a run? You are giving up a lot of potential pressure and ability to ravage weakly defended early centrals, hopefully getting some points and reducing the remaining target of points you need to mill to finish off the game greatly. What you shouldn’t do is EXPENSIVE early pressure. Those decks where you are Chaos Theory, and you put out a Snowball, and you spend all your time taking $3 and then running their Wall of Static on R&D for 1 card, because you are trying to get ‘early pressure’? No. That’s not good pressure. That’s letting the corp get way ahead of you for a minimal number of accesses. Once you see that the R&D ice is a Wall of Static, you don’t run through it over and over for only 1 card. You try to hit other places free. You try to deal with the Wall of Static in an efficient way. You get out an R&D interface so that it’s worth attacking. You do SOMETHING more efficient than paying $3 for 1 access in the early game! Paying a significant amount of money to access things is something you do later on, with an economy, and a card to provide bonus accesses, because the possibility of free accesses has passed by. If that Chaos Theory deck saved up and hit R&D with an indexing, then ran in again for the agenda? Now we are talking. If they instead uncovered your HQ ice, put out the right breaker, hit you with Account Siphon, and then accessed R&D for free, possibly with the Indexings and R&D Interfaces? So much better! Now we have an actual aggression plan! Now we have a real early game! Why are so many players excited about new Shaper decks with Desperado, Parasites, Datasuckers, and Atman? They have strong early games in addition to the great Shaper lategame. It’s not just that they can break lots of ice efficiently later with Datasucker and Atman. It’s that they can do that AND they have strength throughout the game, whereas most earlier Shaper decks mostly just had to build up early. It’s not just the Atman breaking things. It’s the total package provided, all game long. Strong corp decks defend well in the opening, most of the time, and try to reach the midgame reasonably intact. They play good face check punishing ice, cheap end the run ice, and have the ability to distract the runner with a remote. They don’t play tons of conditional ice, tons of ice that is expensive, or tons of ice that only turn on later in the game, like program trashers, big Bioroids, Hadrian’s walls, Tollbooths, Archers, Grim, Swarm, etc. They have more early game ice than just Enigma and Bastion. (Hi. I’d better be ice #23-25 in your deck, not #1-3. Play me as extra ice that you hope to get for free, or pay for much later, because I’m not going to do ANYTHING to get you out of the opening). While big ice can be strong after the opening, and many decks need it, decks with lots of big ice should contain MORE ice and more burst economy than normal decks. In order to play more big ice, a deck must increase its total ice count so that it can do it while also maintaining enough early game ice! Thus, a big ice HB deck should really have 23-25 ice or so, as opposed to more common decks that contain around 18-21. The amount of good early game ice will be about the same, while the amount of big ice will increase. You’ve heard that running early and often is good. Hopefully here you have seen here why it’s good, what info and other benefits we gain from it, some cards that help make it effective, and also some times when it’s NOT good. Spending all your early capital making expensive runs in order to ‘be aggressive’ is NOT good. In general, early on you really love running against face down ice, and you really hate running through face up ice. As the runner, you want to maximize running that results in accesses for free, and minimize runs through actual, rezzed ice. As the corp, you want to effectively get to a point where all servers have some rezzed ice, without giving away too many free accesses in the process. Those are your primary goals of the opening for both sides. Even if, as a corp, your main early goal is to score agendas while the runner isn’t set up, it’s nice if you can do that while simultaneously putting up something in defense of centrals. These factors should guide your deckbuilding decisions, as the opening is one of the most critical parts of the game. They should guide your gameplay as well, trying to maximize early free accesses as runner, or minimize early free accesses as corp.
An early free access is strong for the runner. A access thats better than free due to things like Desperado, Datasucker, or Gabriel’s ability, is amazing for the runner. An early access for a token price is decent for the runner. 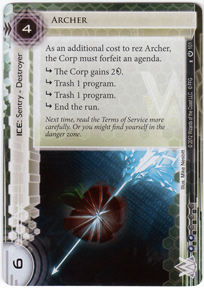 An early access costing several credits, for only one card, is a weak tradeoff for the runner, which will on average increase the corp’s chance of winning. (If you paid $3 but got back $1 from desperado and got 1 datasucker counter however, that is now only a net ‘token price’ and it’s still decent). 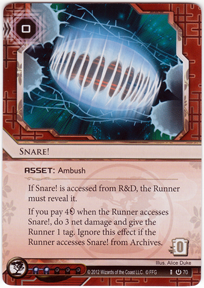 Thanks for reading, and I hope you enjoyed this look into the Netrunner opening! Discuss this post in our forums!